This system is a must for all fishing boats, allowing you to optimize fishing by recording data on catches and best fishing grounds. Historical information including past tracks and activities can be viewed at the same time as the 'live' data. 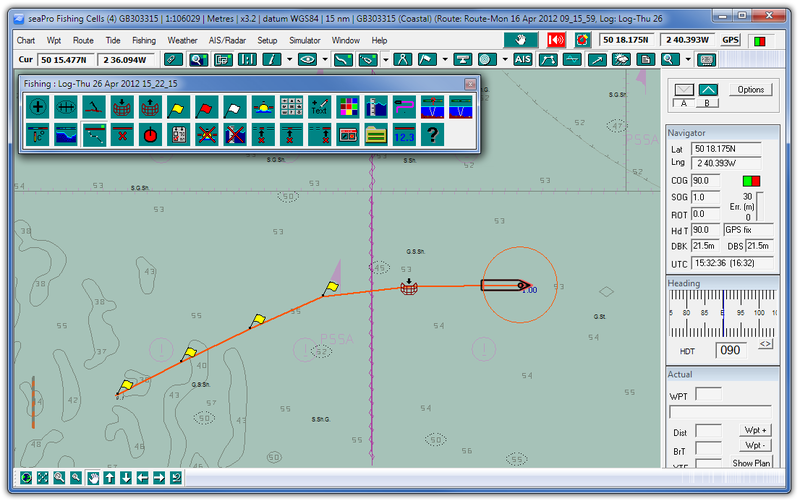 Easy to use, seaPro Fishing provides a dedicated toolbar to provide access to the most used functions such as dropping marks and recording depth soundings to enhance your charts. All data recorded is kept in an open format, unlike competitive systems, so it can be backed up and used in other applications. Allowing you to maximize the benefit of your data. Easy to use toolbar provides access to all the major fishing functions. This offers clear large buttons which makes using seaPro Fishing simple and effective, even in the toughest conditions. locations or fixes (over 256 different symbols plus different colors are provided). Ability to add text notes for catch information etc. Ground Discrimination and bottom mapping - Get a view of the seabed ground type by interfacing the highly acclaimed Seascan ground discrimination unit. seaPro Fishing is suitable for vessels from about from 10m up to full ocean going vessels. The product is not just used in the fishing industry but finds uses diving, wreck hunting and para-military applications. Weather Overlays Can display weather conditions by downloading weather GRIB files (available on the Internet and easily downloaded) including wind speed and direction, wave heights, pressure etc. Typical download files give 3 - 5 day forecasts. Some data is free other is charged for. 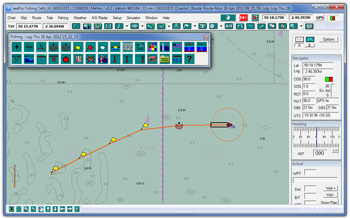 Multiple Color Plotting User defined colours can be used to show depth, sea temperature and the seabed type in specified colors. Download the demo or request a demo CD to fully appreciate how navigating with seaPro can make your time at sea easier and safer.